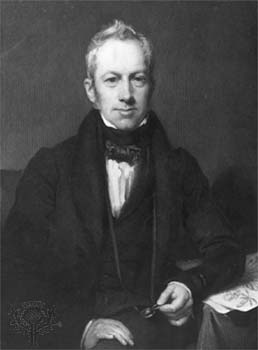 Robert Brown was a Scottish botanist best known for his pioneering work on cell structures, and for the observations of the movement of minute particles in water that gave rise to the concept of Brownian motion. He was the first botanist to define what we now know as the Gesneriaceae. Gesneriaceae was one of the last major families to take on its present taxonomic form. Originally two separate families were recognized: the New World “Gesneriaceae” (formally established by De Candolle 1816), and the Old World “Didymocarpaceae” = “Cyrtandraceae” (established almost at the same time by D. Don 1822 and W. Jack 1823, respectively). In 1839, the famous British botanist Robert Brown united the two families into a single one and this was from then on universally accepted. Bentham (1876) was the first to publish an overall account of Gesneriaceae in the new, wide sense. C.B. Clarke (1883) wrote an important revision of the Old World “Cyrtandreae”. Fritsch (1893/94) was the first to present a detailed revision of the whole family, recognizing subfamilies, tribes and subtribes. B.L. Burtt, from the Royal Botanic Garden Edinburgh, presented a new classification of Old World Gesneriaceae in 1963. He recognized that this group (which he referred to as subfamily Cyrtandroideae) shares a conspicuous and uncommon feature: the anisocotylous seedling. He distinguished five tribes: Cyrtandreae, Trichosporeae, Didymocarpeae, Klugieae, and Loxonieae. Additional tribes (Saintpaulieae, Rhynchotecheae, Ramondeae, Titanotricheae) were suggested later by Russian and Chinese authors (Ivanina 1965, 1967; W.T. Wang 1990, 1991, 1998), but were not generally accepted. Though exhibiting an Old World distribution, Burtt (1963) did not include the Australian and SW Pacific genera Fieldia, Lenbrassia, Negria, Coronanthera and Depanthus in subfamily Cyrtandroideae. On grounds of the isocotylous seedlings these were referred to tribe Coronanthereae, and together with the temperate South American tribe Mitrarieae (Mitraria, Sarmienta, Asteranthera) attributed to the New World Gesnerioideae. Cyrtandroideae, comprising the tribes Klugieae, Cyrtandreae, Trichosporeae and Didymocarpeae. The latter and largest group comprised 64 genera, simply arranged in an alphabetical order. The advent of cladistics in Gesneriaceae research (starting with Boggan 1991) and molecular systematics (starting with Smith & Carroll 1997) provided a novel set of data and showed that the former morphology-based classifications were in need of considerable modification. The classification of Weber (2004). This simple grouping may still serve as a rough attribution of gesneriad taxa and is used, where appropriate, in some of the previous sections.